The Gold Coast Commonwealth Games came to an end on Sunday with the host country, Australia, making the home ground advantage count. The games took place over an 11-day period of great sports that included 6,600 athletes, from 71 countries in the world, participating in 18 different sports disciplines. The Commonwealth Games were a massive success, heralded as having the most integrated sports program in the games’ history. This high praise is derived from the unprecedented achievements witnessed in the games especially with regards to medals awarded for the first time to Women’s Rugby Sevens, Beach Volleyball and Para Triathlon. The largest sporting event in Australia was boosted by the host country’s overwhelming dominance, with the Aussies sweeping in most disciplines. Australia took home a combined 198 medals that included 80 gold medals, 59 silver and 59 bronze medals. England was a close second, with a total of 136 medals that consisted of 45 gold medals, as many silver medals and 46 bronze medals. India rounded off the top three counties in the competition with 66 medals in all. 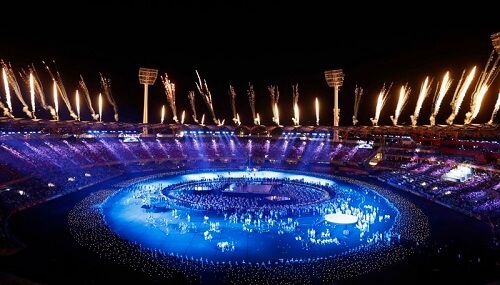 The colourful display of the closing ceremony to the Gold Coast Commonwealth Games was marred by the decision by the broadcaster to have athletes take the field before the ceremony began. The decision inevitably meant that television viewers would be deprived of the opportunity to see the Australian para-sports past master Kurt Fearnley carry the Australian flag into the venue. Commonwealth Games chairman Peter Beattie conceded that the organisers ‘stuffed up’ in their attempt to avoid a scenario where athletes would be kept “standing around” waiting for the ceremony to end. This decision was heavily criticised since footage of the athletes entering the stadium is part of the games’ rich tradition. The Commonwealth Games may not be the last time before the world descends to Australia, with the Aussies recent bid to host the 2027 Rugby World Cup and the 2021 Women’s Tournament. The next Commonwealth Games will take place in 2022 and will be held in England. For the latest news about sports and online gambling in Australia, stay tuned to Pokies.com.